GoMA is the most visited modern art gallery in Scotland. Housed in an elegant 18th century building in the heart of Glasgow, it is the centre for the modern art collection owned by the city. It also offers a programme of temporary exhibitions by local, national and international artists. The gallery hosts an active education programme including regular workshops, projects and talks for all ages. One of the most elegant buildings inGlasgow's city centre, Hutchesons' Hall was built in 1802 - 5 to a design by David Hamilton. It incorporates on its frontage the statues, from an earlier building of 1641, of the founders of Hutchesons' Hospital, George and Thomas Hutcheson. A major reconstruction in 1876 by John Baird heightened the Hall and provided an impressive staircase. The interior is hung with portraits of Glasgow worthies. A permanent multi-media exhibition, 'Glasgow Style', includes film and a gallery selling work by young Glasgow designers. Step back in time and discover a piece of Glasgow's history with a visit to the only medieval house in Glasgow. Bishop Muirhead built Provand's Lordship as part of St Nicholas' Hospital in 1471. Since then it has been a manse, an alehouse and even a sweetshop. For over 500 years it has watched the changing fortunes of the city and nearby Cathedral. Behind the house is the St Nicholas Garden. Designed in 1995, this medicinal herb garden is a haven of peace and tranquillity. The Provand's Lordship is the oldest house in Glasgow and has a magnificent collection of historic Scottish furniture. 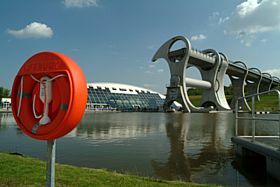 The Falkirk Wheel is a masterpiece of engineering which transports boats between the Forth and Clyde Canal and the Union Canal. It is the only circular boat lift in the world and is located near Rough Castle Fort, close to the town ofFalkirk in central Scotland. The Wheel was opened by Her Majesty the Queen in 2002 and was hailed as one of Scotland's greatest engineering achievements. Known as the Millennium Link, it was commissioned to regenerate the canals and reconnect Glasgow with Edinburgh via inland waterways. It was built as a landmark structure rather than just a reconstruction of the original locks and is now a predominant working sculpture. When the Forth of Clyde Canal opened in 1790 it enabled ships to sail from Grangemouth to Glasgow negotiating 40 locks and 32 swing bridges. The Union Canal opened in 1822 and ran from Edinburgh to Falkirk. These canals were connected by a sucession of 11 locks to overcome the 24 metre difference (roughly the height of an eight storey building). During the 1930s, the locks became neglected through lack of use and were filled in. Airdrie Central Park has plenty of space for both families and friends looking for a relaxing day out. A popular spot for joggers, cyclists and sunbathers, Airdrie Central Park can provide you with a fun family day out. Stirling Castle is a great symbol of Scottish independence & a source of national pride. Knights, nobles and foreign ambassadors once flocked to the Royal Court at Stirling Castle to revel in the castle's grandeur. A place of power, beauty and History. The museum has many attractions for all the family, including Scotland's only operational heritage tramway and recreated mine, with guided tours, miners' cottages, a great all-ages playpark and lots lots more.